Even the most half hearted search for this pub online will throw up a collection of reviews that are far from flattering with words like ‘rundown’, ‘shabby’ and ‘awful’ being particularly popular with previous patrons of the place. If you were to walk in to this bar and expect it to be a gloriously restored tribute to Edwardian interior design you’d certainly find yourself crushingly disappointed however there is something to be said for this interesting little corner pub. 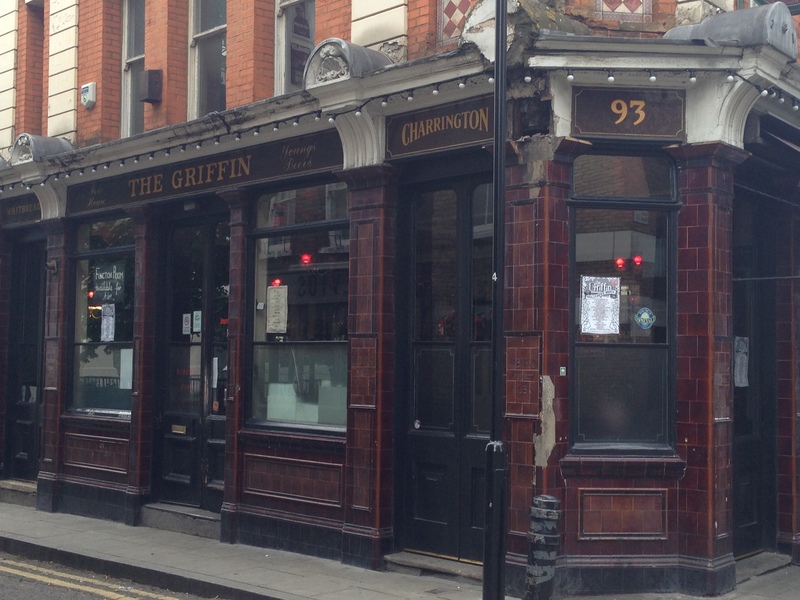 It’s nestled along a quiet street not too far from Shoreditch High Street Overground station and in an area which teems with arty book shops and ‘hipsters’ The Griffin almost seems out of place. 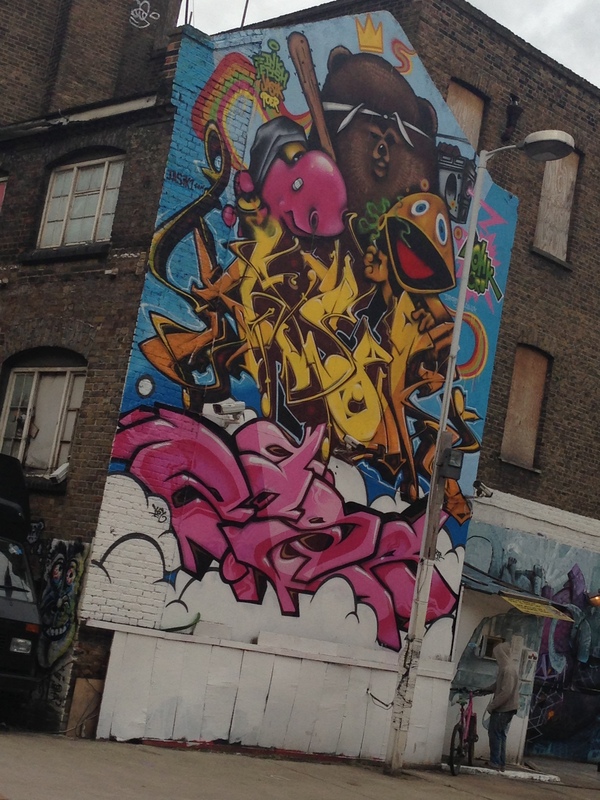 The outside probably hasn’t changed much though since it was built, though I’m fairly confident that the strangely menacing twenty metre high mural of Zippy and Bungle getting stoned wasn’t there in the good old days. There’s no escaping the fact that the interior of this pub has seen better days and would benefit from a bit of attention or cash. For me though that’s sort of where its charm lies. The dim lighting, the mismatched stools and the wobbly tables (I’m choosing to ignore the cracked window repaired with duct tape) add to the experience of being in a very honest, very real East London pub. It’s an ideal place to visit if, like me, you’re not an enormous fan of the carbon copy ‘gastro pub’ or the kind of places where people go and arse about with their MacBook whilst endlessly listening to The Smiths and like somewhere with a bit of grubby character. I also have to confess that I was won over hugely by the open coal fire halfway along the room which lent the entire room a soporific warm glow perfect for a bit of ill advised Sunday afternoon boozing. The bar staff were immediately quite friendly and more than happy to let me sample an admittedly meagre beer selection which comprised of Doom Bar and two guest ales. Other clientele was actually very varied, a few colourful locals (who I ended up being drawn into games of pool with on a table which could masquerade as a Jackson Pollock), some trendy typed and a few older couples. It’s certainly not a family pub which is excellent as far as I’m concerned but worth knowing if you have decided to procreate and were planning a visit with the resulting offspring you now have in tow. Final verdict for this place is that it’s well worth swinging by on a gloomy weekend afternoon for a few beers, best to avoid in Summer as I don’t think daylight has entered here since the late 40’s. It’s inexpensive and potentially really good fun as long as your expectations are right. The only thing I personally disliked was the terrifying precipice that presents itself when you walk into the gents, no top step, no warning, just space and there are many many reasons to avoid falling on that particular floor.